According to UFC president Dana White, it takes an entire village to build a division. 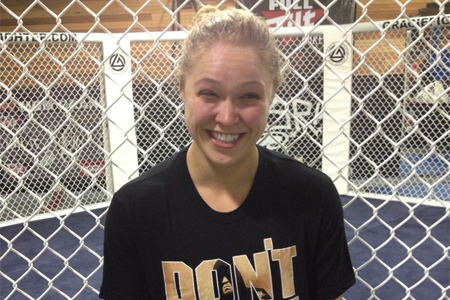 Unfortunately for women’s mixed martial arts, the sport is currently swimming in the shallow end featuring only Ronda Rousey (Pictured) and the others. Until more ladies learn how to scrap like the reigning Strikeforce bantamweight queen, White will never allow a female to set foot inside of his Octagon. “My thing with the female fighting is, I love Ronda Rousey, man,” White revealed over the weekend. “She’s as tough and as nasty as it comes. I love Ronda, but I think Ronda is one of those girls that’s up here (positioning his hand by his head). You have a lot of girls that compete in the sport that aren’t on her level. Rousey captured the 135-pound crown by submitting Miesha Tate in the opening round of their heavily-hyped grudge match. The 25-year-old is perfect through her first five professional fights, with all of her bouts ending in 1stRound armbar fashion. As the challenger, the “Rowdy” one entered her shootout as a 3.5-to-1 odds-on favorite. While preparing to step into the hexagon to make her first title defense, Rousey is pegged as a whopping 5-to-1 favorite to steamroll top contender Sarah Kaufman. With former Strikeforce featherweight champ Cristiane “Cyborg” Santos currently serving a drug suspension, parlayed with doubts surrounding her ability to shed 10 pounds and compete in the bantamweight division, you can certainly see where White is coming from. “I think after you’ve seen these two (pointing to Demetrious Johnson and Ian McCall) fight, and you know [Joseph] Benavidez, you know who the top three fighters are in the world, and then there’s a whole list of guys under them,” White said of his new, yet blossoming flyweight class.